Please welcome Bailey Cattrell to The Qwillery. 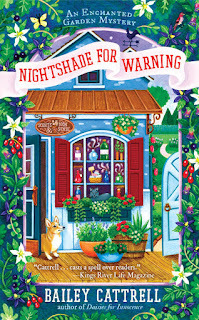 Nightshade for Warning was published on May 2nd by Berkley. 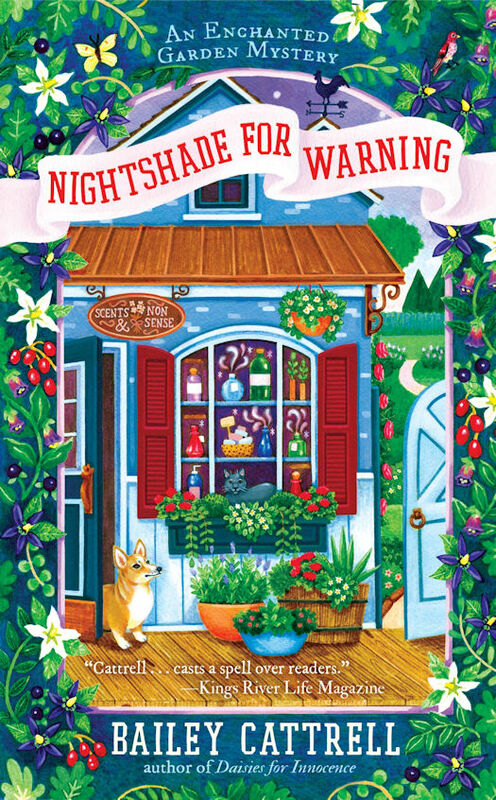 Nightshade for Warning is the second installment in Bailey Cattrell's whimsical Enchanted Garden Mystery series. Elliana Allbright, proprietor of Scents and Nonsense in picturesque Poppyville, California, has recently discovered that her affinity with plants and aromas is more magical than mundane. While trying to carry on a long distance relationship with old friend Ritter, Elliana is getting ready for her tiny home, once a garden shed, to be featured in an article for a national environmental magazine. Little does Ellie know that the interviewer is about to become Poppyville's newest murder victim, and that she will feel compelled to solve the mystery when her half-brother's new girlfriend stands accused of the crime. Elliana is petite and sweet.. She possesses a curious nature and is exploring what it means to have magical tendencies. She lives quietly and happily in the garden of her beloved gift and aromatherapy shop with her darling Corgi, Dash, and the regal shop cat she acquired with the shopfront, Nabokov. Ellie's best friend, Astrid Moneypenny, a pet whisperer, also helps out in her shop, providing delicious baked treats for Ellie's customers. Maggie Clement is Ellie's part time shop assistant, dividing her time between Scents and Nonsense and the Roux Grill, the eatery now run by Ellie's smarmy ex-husband Harris. Harris turns up in this story like a bad penny, but is only on the sidelines for most of the book. A character that was only touched on in the previous book in this series is Colby, Elliana's half brother. He has been wandering the country for some time, but has suddenly returned to Poppyville with a stunning new girlfriend in tow. Larken Meadows is as sweet as her name, but she's a staunch environmentalist who gets into a heated argument with the murder victim the evening of his death. Blake Sontag has a very short cameo in the story before he is murdered. Blake is a Poppyville native who returns for the tiny house story and is a thoroughly unlikable character. His death is not much lamented, even by his former fiancée, local business powerhouse, founder of the women's business association, The Greenstockings, and confirmed man-eater, Cynthia Beck. 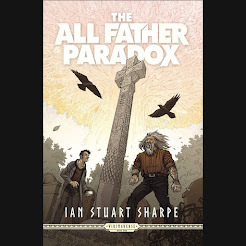 There are also appearances from the other Greenstockings and various new and old townspeople, including detective Max Lang, Ellie's nemesis from the first novel. 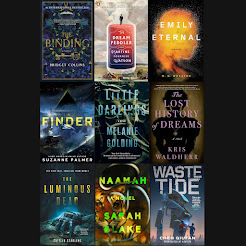 Newcomers of note include; Joyous Sontag, Blake's surly, reclusive sister, who hides a secret that proves to be integral to the story, Vaughn Newton, a mysterious giant of a man who also knows Ellie's ex-husband, Tanner Spence, a dreamy photographer who had reason to hate Blake, and Felicity Donovan, manager of the hotel where Blake was murdered, and another person who had a grudge against him. The plot moves along well throughout the entirety of the novel, not too fast, but not too slow either. 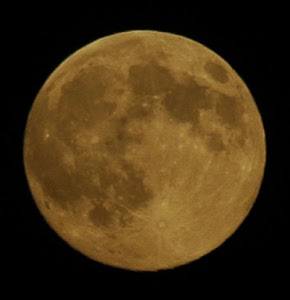 The author is able to use scent descriptions to breathe deeper life into scenes and characters that are unique and enhances the entire story line. There are a couple of twists and surprises in the novel that make it stand out from other magical cozy mysteries. This was a fun read and the Enchanted Garden Mysteries are destined to become one of my favorite book series and I am eagerly awaiting future installments. Note from Qwill: Our reviewer Jennifer is back after taking a break after her daughter's birth. 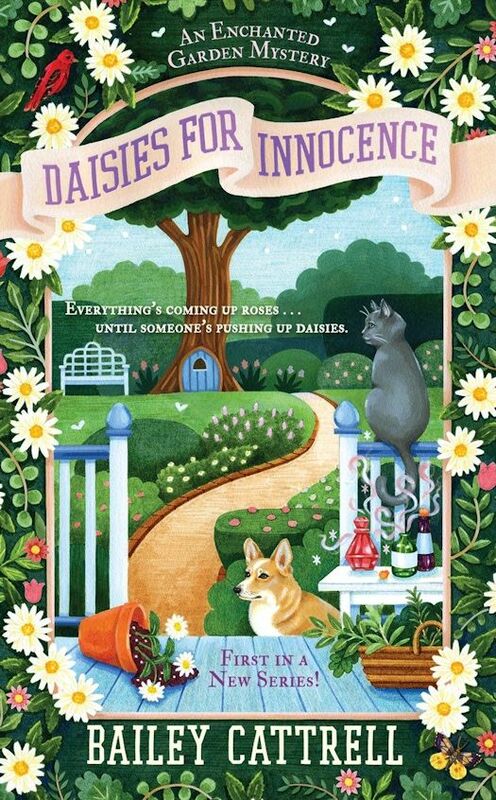 While reading Daisies for Innocence (the first Enchanted Garden Mystery), Jennifer found the name for her daughter - Elliana! Welcome back Jennifer! In the subject line, enter “Nightshade“ with or without the quote marks.